A Pekin duck. It is believed that Donald Duck was modeled after a Pekin, as is the AFLAC mascot. Photo courtesy Marin Winter | Wikimedia Commons. This is Page 2 of a four-page article. Click on the black links below to visit other pages. In addition to White Pekin ducks, Muscovy, Moulard and Mallard ducks are also marketed in the United States. Different duck breeds are better for different products. The most popular breed in the United States is White Pekin or “Long Island duckling.” This is what is typically used for “roast duck” at most restaurants, and found in supermarkets. America has other favorite eating ducks and duck parts. Many begin with an “M”—no wonder it’s confusing! Here’s a basic “duck glossary” to help you master the choices. By the way, duck is an all “dark meat” bird; it has no white meat. The British term for Muscovy duck. Confit is the French word for “preserved.” Confit de canard, or confit of duck, is a duck leg that has been cured, partly or fully, in salt, and then marinated and poached in duck fat, seasoned with garlic and other herbs. This rich, and not very cardio-friendly dish is very popular among lovers of duck. CONFIT: Think leg cooked in duck fat. 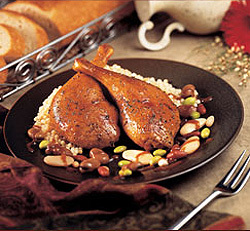 Maple Leaf Farm’s confit de canard, in a classic preparation with heirloom beans. Foie gras, or “fat liver,” is a specially fattened and rich liver created by a process called gavage: overfeeding ducks with corn so that their liver grows to four times its normal size. (This technique was developed by the ancient Egyptians.) The result is richer, more buttery and delicate than a regular liver. Historically, this practice was done with geese, but the far more gentle ducks are used today (geese can be quite aggressive and bite their handlers), typically the Moulard variety. Foie gras can be served as a hot dish or at room temperature, whole or in a pâté (terrine) or mousse. It is a delicacy, and costlier than other parts of the duck. Animal rights activists deplore gavage as animal brutality, due to the force feeding procedure and possible health consequences to the duck or goose of an enlarged liver. Terrine of foie gras from MackenzieLtd.com. To others, this argument seems moot, as the bird is raised for slaughter and not longevity; and ducks and geese have long gullets that can accept a feeding tube without pain (think of a pelican swallowing a fish). In fact, visits to a duck farm that produces foie gras will show the ducks (which are free-range) waiting for their human feeder each day, and quacking in anticipation of their meal. 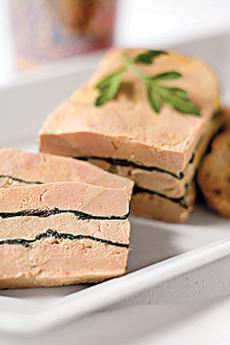 FOIE GRAS: Think liver, whole or in pâté. Another term for the white Pekin duck. Magret is the breast of the Moulard duck (see below). The breast is larger than any other duck breast, and to appreciate its nuances, it must be cooked even rarer than Pekin duck. If you like your meat medium or well done, forget magret: according to our Wine Editor and consulting chef Kris Prasad, “a medium or well-done magret will be tough as shoe leather.” Enjoy this large duck breast in rare slices! Take a gander at this gorgeous Pekin breast. 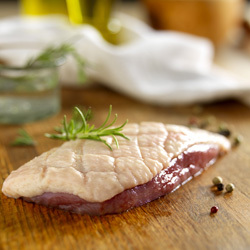 If you don’t want to cook it yourself, Maple Leaf Farms offers sliced, cooked duck breast with three different seasonings. The Mallard is probably the most familiar breed of duck. It’s the duck with the emerald green head and white collar, and is the ancestor of almost all domestic ducks. If your friend shot the duck you’re eating, ask if it’s a mallard. (Farm raised mallards are available on a limited basis.) The Mallard is the breed from which all domestic ducks, except the Muscovy, are descended. It is smaller and tougher than the Pekin. While the breed has very little fat, it can taste greasy and gamey. MALLARD: Think duck shot by a hunter. 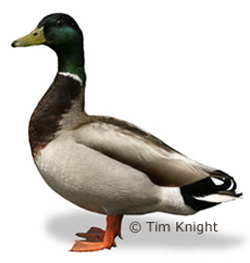 Illustration of a male mallard duck, courtesy Tim Knight. A moulard is a sterile hybrid of the male Pekin and the female Muscovy, and is bred for breast meat and foie gras. The Moulard is larger than the Pekin and has a stronger, gamier taste; it is also considerably fattier. The meat can be stringy and chewy, so the breed is primarily raised for its liver for foie gras; and for its breast, which shows well when cooked rare. Moulard ducks comprise 1% to 2% of domestic duck consumption. MOULARD: Think breast (a.k.a. magret) and foie gras. The Muscovy duck, known as the Barbary or Barbarie duck in England, is raised for its breast meat and liver, is leaner than the Pekin duck. Because the breed originated in the hot climate of Brazil, it has thinner skin and much less fat than other breeds, making it a better choice for cooking and eating (the males are meatier than the females). The Muscovy has redder meat and a more pronounced flavor. A boneless hen breast is like a “duck steak” because each “side” weighs about 8 ounces: one breast can be shared by two people. The Muscovy is hybrid with Mallards (and sometimes Pekins) to produce Moulards, which are also low in fat. The Moulards are used for foie gras, but the Muscovy liver is attractive for that purpose as well. 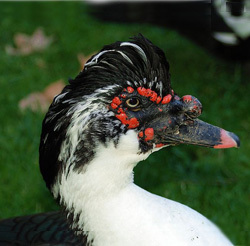 The Muscovy duck has exotic markings. This is a male; the female has a solid red face and a white comb with a white body. Photo courtesy of Alvesgaspar | Wikimedia Commons. The Muscovy comprises 3% to 4% of U.S. duck consumption, and is the only domestic duck breed not descended from the mallard. The species is named after the Muscovy Company, which began shipping the ducks to Europe in the mid 1500s; The meat is leaner than the fatty Mallard. 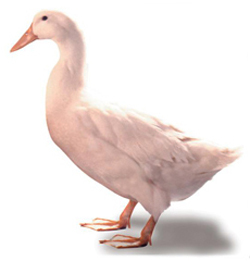 The foie gras industry in Israel reportedly uses a Muscovy-Mallard hybrid. There are wild Muscovy populations in parks in nearly every state in the U.S. and Canada, where their aggressive begging for food and their droppings cause problems. MUSCOVY: Think breast and liver. The Pekin, the most popular domestic duck breed, originated in northern China thousands of years ago and was domesticated at least 2,000 years ago (Beijing used to be called Peking by westerners). It is the most popular type of duck today and is discussed at the beginning of this article. Don’t confuse it with Peking duck, a duck dish served with pancakes, scallions and hoisin sauce. Pekins were brought to Long Island hundreds of years ago, and Long Island served as the center of the duck industry for several years. This is the origin of the term “Long Island Duck” or Long Island-Style Duck. The meat is tender and mild. The preponderance of Pekin ducks means that most duck eggs for sale are Pekins as well. PEKIN: Think meat and eggs. 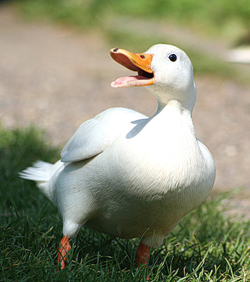 The white Pekin duck is the most popular eating breed in America. The feathers are always white, but the beak can be either pink or yellow. Once they could fly, but now they remain on land. Similarly, they can swim instinctively, but are content to drink water and stay on land. Photo courtesy Maple Leaf Farms. Called canard à la presse or caneton à la presse in French, pressed duck is an elaborate dish developed in the 19th century at La Tour d’Argent restaurant in Paris. In brief, the duck carcass is pressed in a device like a wine press to extract all of its juices, which are then cooked into a sauce with the minced liver and served with the breast. The legs are broiled and served separately. PRESSED DUCK: A fancy prepared dish that can be made from any breed of duck, but preferably a Pekin. Lifestyle Direct, Inc. All rights reserved. Other images are the copyright of their respective owners.